How could we resist Gwyneth for a FFF. There are a lot of people out there who love to bash Gwyneth but let's give her some credit. Seriously, look at her sorted life. Born to two beautiful parents who loved her unconditionally, raised on the Upper West Side, not the best student at The Spence School, so she asked her godfather, Steven Spielberg about the movies and lo and behold, she had a part. She was engaged to Brad Pitt, won an Oscar, and wears designer clothes. Did I mention she is tall, blonde and skinny? She has a web site called Goop which has been known to get her into trouble. Look at her background. It's not that she means to offend the poor folks, it's just that she has really never known any poor folks. So when she says the best thing a new mother can do after giving birth is to get a personal trainer and a new stylist, she means it. Not in that Marie Antoinette way but in that, "I don't really know any better," way. So when she gives advice on “finding a good balance between having a career and being a mom,” she offers up a venture capitalist and Stella McCartney, not a single secretary with no day care. Most of this snarkiness is clearly jealously, and if you had to be jealous of someone, it might as well be Gwyneth. So when she decided to write a cookbook, she did what all aspiring cookbook writers do -- she hired a cookbook writer. 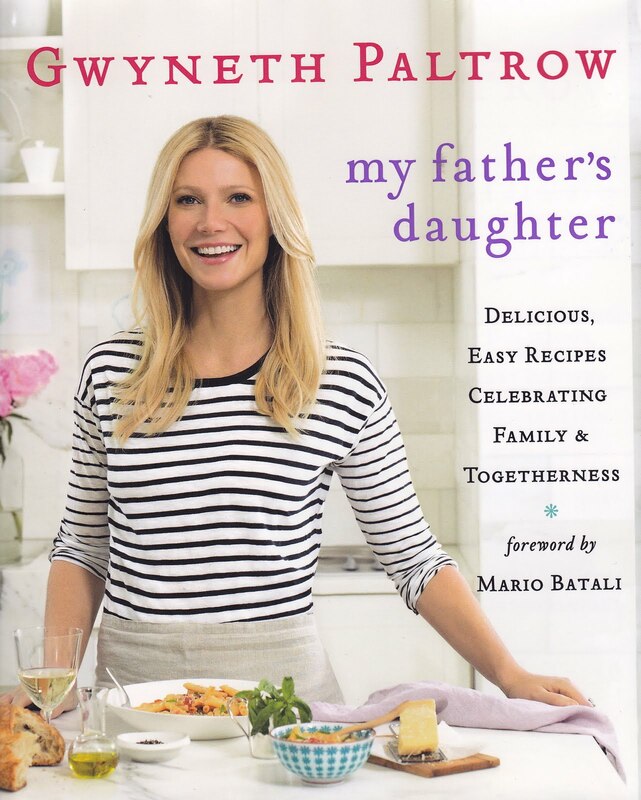 While the actual writer if her cookbook, Julia Turshen, does get a mention (and a picture with Gwyneth). And speaking of jobs to be jealous of, spending a year in London hanging out in Gwyneth's kitchen cooking is not the worst gig in the world. Besides, you show me someone with 10 or 12 cookbooks and I'll show you someone who has a writer coming up with those recipes, even Sandra Lee didn't think up that Kwanzaa Cake on her own. So Gwyneth's cookbook is entitled My Father's Daughter. It is in the end a kind tribute to her father who died in 2002. The ever snarky Jeffery Steingartner wrote about Gwyneth for Vogue and to say he was smitten would be a gracious understatement. "Only after an hour had passed did I notice the sharpness of her knives. I was impressed. Gwyneth sharpens her knives by hand, using a MinoSharp, a contraption that you fill with water before pulling the blade between two submerged ceramic wedges. I've never gotten the hang of that little device. Later she told me about her outdoor pizza ovens, one in each of her backyards in London and on Long Island, and I took her ownership of two of them as the mark of her seriousness as a cook... Gwyneth and Chris own two adjoining houses and three backyards. They bought the first house from Kate Winslet; it has the kitchen and the backyard where the wood-burning oven stands. (Later they bought the house to the left, and finally the ground floor of the house to the right, which earned them the garden. They seem to believe that extra backyards make good neighbors.)" For those of you keeping score we have five houses and two wood burning pizza ovens, oh yes, and sharp knives. The cookbook is a lovely, beautifully produced book. There is no liquid nitrogen, no squid foam, just nice family recipes that you (or your personal chef) could whip up without ever breaking a nail. I must say, I was expecting it to be bit more veggie and I was pleasantly surprised, thought there is no red meat. Here is a nice chili sans red meat or white meat for that matter. As seen at Cookbook Of The Day. Actually, it seems like Marie Antoinette meant it in the same spirit -- she just didn't know any poor people. Not a GP hater, though. Gwyneth looks so adorable in this picture! I wonder if you have more info about her book!